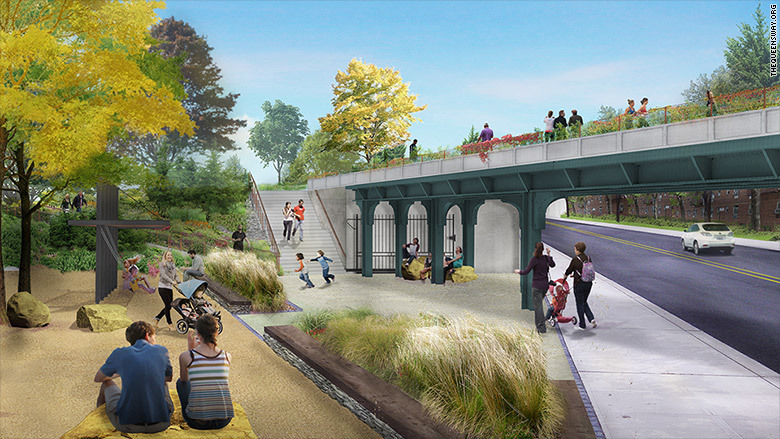 In the New York City borough of Queens, plans are afoot to turn an abandoned elevated rail line into a park. Sometimes to find new parkland, you have to look up. 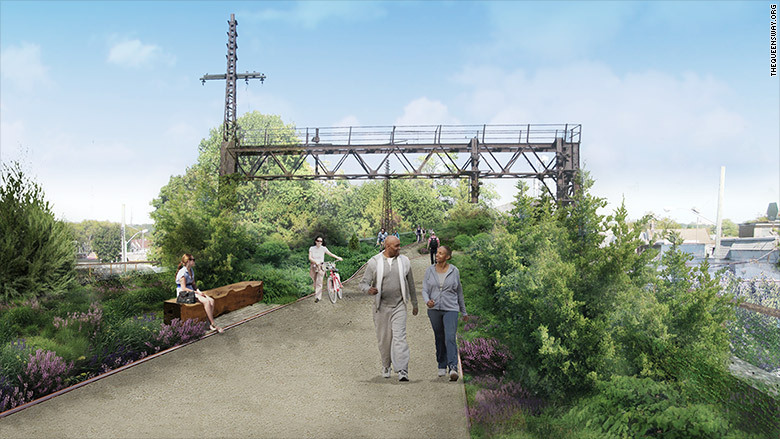 In a densely populated, park-starved part of central Queens, a coalition of local residents and the Trust for Public Land are working to create new open space from a partially elevated rail line from the 1800s. The QueensWay, as it's being billed, is designed to be the Queens equivalent of Manhattan's highly successful Highline, which turned an elevated rail line into a park, creating open space and driving economic development in an underserved part of the city. If built, it would be one of just a handful of elevated parks around the world. But it faces big hurdles, including raising $122 million to construct the 3.5 mile-long park and getting the support of New York City, which currently owns the land. 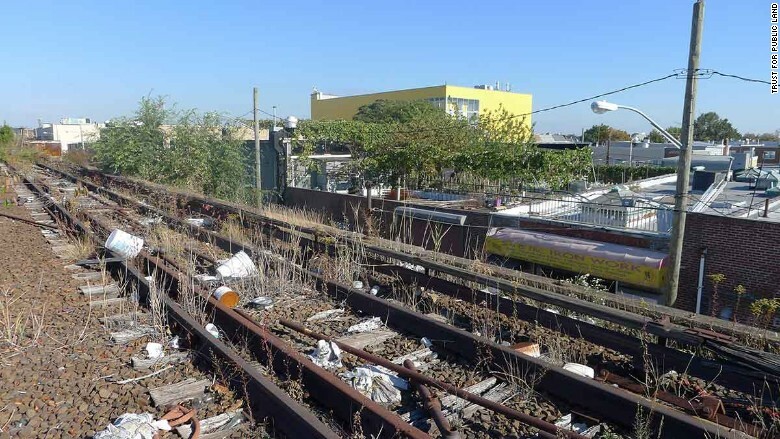 Built in the late 1870s, the line originally connected the Rockaways neighborhood in the south to the main train tracks in the central part of Queens. 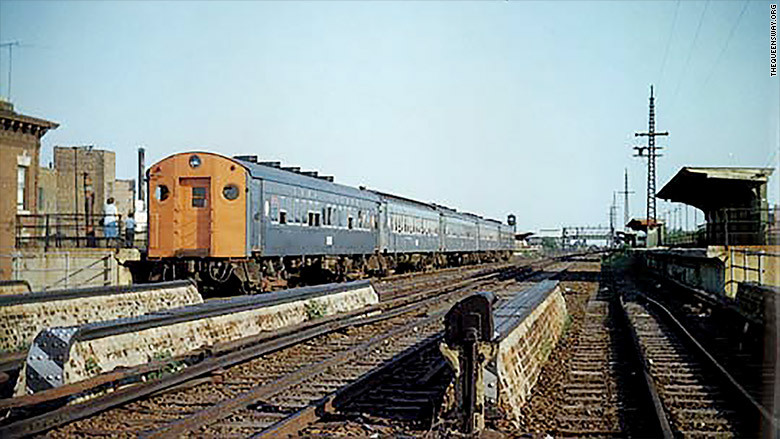 Service was eventually stopped in 1962, not long after this photo was taken, after a series of fires and the addition of subway service to the Rockaways made the line unprofitable. Now the line sits abandoned. About a mile of it is elevated above roadways or businesses, like this part in the Ozone Park neighborhood. Another 2.5 miles is either at ground level or slightly below. All of it is in a state of disrepair. 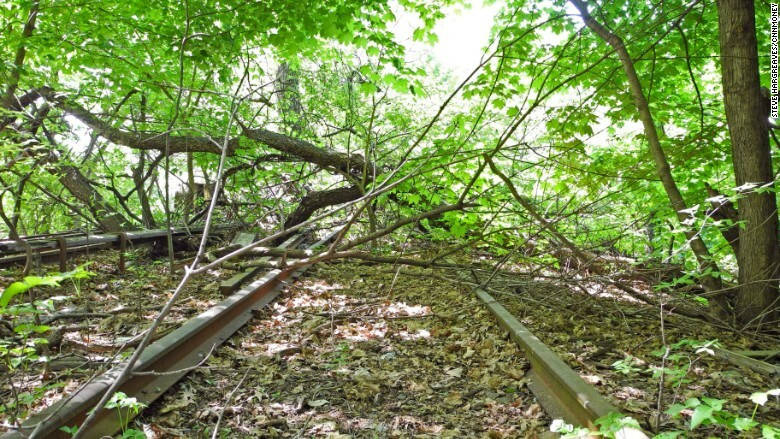 Here, branches cover a section of track in the Forest Hills neighborhood. 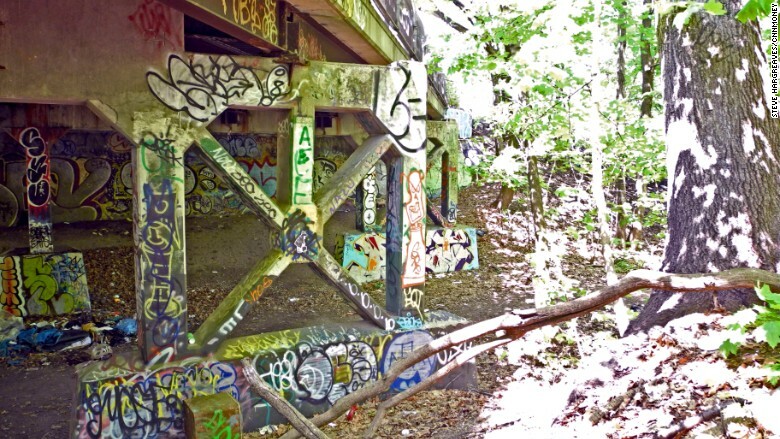 Near the Glendale neighborhood, the line runs under Myrtle Ave. as it passes through Forest Park and seems to be a popular spot for homeless camps. The plan is to turn the whole thing into a multi-use park. The elevated sections provide a unique vantage point to view the surrounding neighborhoods. 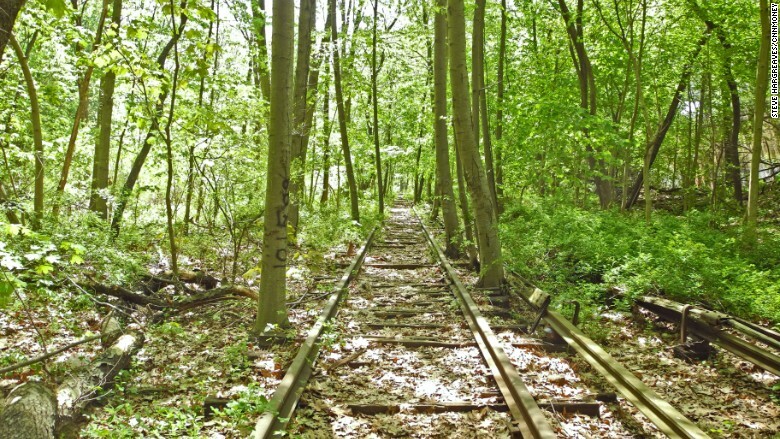 Over 300,000 people live within a mile of the line and 75% are in favor of turning it into a park, according to a poll commissioned by the Trust for Public Land. Some residents, especially in the Rockaways, would like to see train service restored along the line. Adrian Benepe, director of city park development for the trust, said that would cost billions. The Metropolitan Transportation Authority, which would run such trains, said it has no plans to bring service back to the line. The path itself is wider than the Highline so there's room for both biking and walking lanes. A big reason why the trust is focusing on this part of Queens is the lack of open space. There are only 0.2 acres of park per 1,000 residents, compared to the citywide average of one acre. 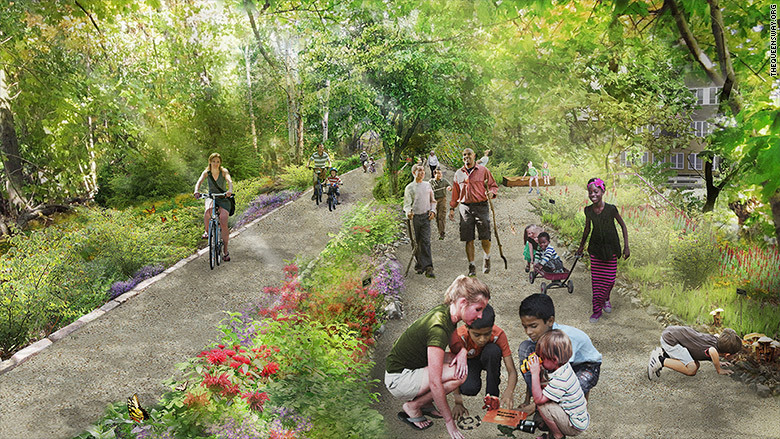 It would offer pedestrian and bike access to Forest Park -- one of the biggest parks in the borough and a destination that's currently reached mostly by car. While some residents who live next to the tracks are concerned about privacy, Benepe said the proposed design includes vegetation and public art provide a natural barrier. "There's always a fear of the unknown," he said. "But it's too valuable of a resource to leave abandoned." Central to the park's design are access points to the neighborhoods. The trust estimates park visitors would inject up to $21 million a year into the local economy. They've even drawn up a map highlighting food in the neighborhoods, which mirror the diversity of Queens as a whole. Cuisines include Colombia, Polish, Guyanese and Bukharian. So far, the trust has raised about $3 million for design studies. It believes it can raise the rest from a mix of city, state, federal and private sources, and hopes to start construction within the next three years. The big holdup now is City Hall, which has yet to commit to the plan. "We look forward to continuing conversations with stakeholders about the future of this asset," said a spokesman for New York Mayor Bill de Blasio.